Every place in the world can have a marvellous nightlife, but the nightlife in Thailand is a one of a kind experience. The nightlife in Chiang Mai, better known as the city of temples in Thailand, is not oblivious to hosting a good time when the sun sets. Chiang Mai turns into a treasure trove at night, when streets line up with markets, alcohol starts flowing, and there is a buzz of friendly cheer in the air. The nightlife in Chiang Mai has something for everyone and shows locals and tourists how to have a good time. So whether you're a thrifty shopper, a party animal, a food connoisseur or a travel enthusiast, Chiang Mai's nightlife will keep you pumped through the night with not a dull moment to spare. Warm Up Cafe is less of a club, and more of a party institution. It has been around for almost 15 years now, and is considered the best spots for nightlife in Chiang Mai. Regulars swear by its electric vibe and rocking ambience. It is a perfect blend of Thai and western clubbing styles, with DJs belting out an eclectic range of songs. Tables packed together are usually stacked sky-high with whiskey bottles, surrounded by partygoers swaying to the music and having a crazy time. It is best to visit during weekends after 10:00 PM to let your hair down for a wild night of drinks and dance. Recommendations: Pre-book tables in advance since the club is crowded on most days. Undoubtedly one of the most popular and beloved restaurants in the city, The Good View is known for its magnificent aesthetic and wide menu. It overlooks the Ping River which makes for an exquisite panoramic view, lending the restaurant its name. It specialises in Thai meats, seafood and also western fast food, all priced reasonably, beginning from THB 140. Cocktails are delicious too, and are considerably cheap at THB 150. It is best to visit after sundown, with the glittering skyline and a plate full of gastronomic delight creating a surreal experience you will never forget. Recommendations: The yellow crab curry, stir-fried squid, fried shrimps and red snapper fish are must-try dishes. Among the many clubs in the Old City, Zoe In Yellow is the most prominent since it is known for being extremely hot and happening. It is packed with young crowds, especially foreign backpackers and travellers partying on a budget making it an exciting party destinations in Chiang Mai. Drinks are free-flowing, since prices are quite low, with beers starting at THB 60 and cocktails starting at THB 100 only. All sorts of music, reggae, electro-funk, hip-hop and pop, can be heard reverberating in the streets, spreading good vibes. Even when things start winding up here, the party just doesn't stop. The crowd moves over to Spicy, another nightclub in the vicinity that guarantees insane partying well into the night. Recommendations: This club tends to get very crowded, so look out for your valuable belongings. Tha Chang Cafe is a local outdoor bar, popular in the Old City. It is set up along the roadside, in a never-before-seen pub aesthetic, and decorated with lanterns decked on trees. You can expect to find a majority of the local crowd hanging out here, since it is a great spot for a night of casual drinking. Alcohol is served cheap, with beers, whiskey and cocktails beginning from THB 60. The food menu consists of several snacks to pair with drinks. This cafe offers a once-in-a-lifetime experience of drinking like a local, so don't miss it. Recommendations: Do try the bucket cocktail, especially if you are with a large group. Van Bars are one of those quirky experiences one aims to have in Chiang Mai. These can be thought of as mobile bars, wherein buses or vans have been converted to mini pubs. They are mostly visited by tourists or locals looking to pre-booze before going to fancier and more expensive nightclubs. These mini-parties can be found all over the city, the most notable ones being located in and around the Tha Phae Gate. They make cool hangout spots, complete with lights, music and dance setting the mood for a great outdoor party. Atop Sana Lanna Hotel, a boutique hotel on the banks of River Ping, The Roof is a rooftop bar in Chiang Mai. As the name suggests, The Roof is on the roof the hotel, offering breathtaking 360 degree views of the scenic Ping River, Chiang Mai and the Doi Sothep temple. It is pretty windy up at The Roof because of the surrounding Ping River and these cool breezes add to the serenity. The seating arrangement is impressive, with varieties of benches and couches, as well as a pool where one can relax. Post sunset is a good time to visit The Roof when it lights up with lanterns, candles and live music. There are happy hours offers from 6 PM, when you can buy two free drinks for one. An overwhelming rooftop bar in Chiang Mai, THC Rooftop Bar is mostly popular among the backpackers and youngsters. THC stands for The Chemical in Marijuana, but contrary to the name, there are no drugs available at this bar. The name only hints that it is a reggae bar, playing trance, reggae and drum and bass music. While you climb up to the staircase to the bar, the neon graffiti lighting and empty rooms seals the deal for ambience. The lovely views of Chiang Mai and Doi Sethop are the icing on the cake. The location of the bar is eerie and not easily found and it has been described as a tree house very often owing to a lot of wooden decoration. The environment remains loud till late night and backpackers are always in the mood to dance. The ambience is made relaxing and comfortable with pillows and tables on the floor. To sum up, it is a good place for views, cheap drinks, music and dance. The bestsellers in the menu are Thai dishes, alcohols and smoothies. Sitting next to the idyllic Ping River is the Riverside Bar, an absolute tourist magnet, especially for a relaxing nightcap. From food to music to service, everything at Riverside is top-notch. If you are lucky enough to get a table close to the river, it will be a night to remember. It is perfect for a date night as well. Riverside was established in the 1984 and has been attracting tourists ever since. Even if you do not get a seat close to the river, there is a lot more to enjoy. The retro interior, the wooden house standing relentlessly, unaffected by the countless floods and the rock/indie band performing English cover songs live. The menu has every Thai dish you have ever heard of, fusion dishes, western dishes, seafood, desserts as well as a wide range of drinks. 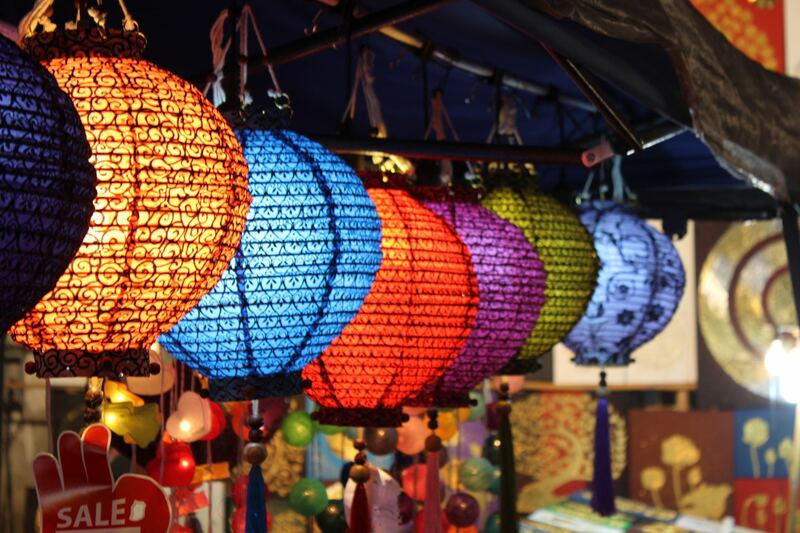 Night Bazaar is the ultimate night market experience in Chiang Mai. It is a large shopping quarter spread over blocks and blocks. Tireless rows of shops sell everything under the sun, from apparel, jewellery, antiques, domestic goods, kitchenware, furniture, games, CDs, cloth, and much much more. Everything is available for cheap prices, and yet a little bargaining is the accepted norm, if done amicably. Options of restaurants and bars are also available in the market, as are various entertainment programs, keeping the area buzzing with activity all night long. Recommendations: Anusarn Market and Kalare Market are the two most popular markets within the Bazaar. The walking streets are among the most popular experiences tourists look forward to having in Chiang Mai. They consist of shops flanking both sides of a street, where vendors sell everything from cheap apparel, shoes, bags, jewellery, souvenirs and delicious Thai street food. Both markets are made lively by live music, bright lights, massage parlours, entertainment performances and chattering voices. Go for the market on Sunday if you enjoy large, friendly crowds, and on Saturday if you are looking for a quieter stroll down the shopping street. Recommendations: There is a lot of walking involved, so wear comfortable shoes and don't carry heavy bags. The Chiang Mai North Gate Market is known locally as Chang Puak, and is located close to the North Gate in Old Chiang Mai city, which gives the place its name. During the day, the area is a local fruit-vegetable market. Come night, the roadside starts lining up with street food stalls which serve freshly prepared Thai dishes. There are tons of options to choose from, and their insanely cheap prices will pop your eyes out. Dishes begin from as low as THB 10, making it a well-known haunt. If you want to feel like a local, visit this market when those late night hunger pangs hit you. Recommendations: These vendors specialise in skewered meat, pork and seafood dishes. Ploen Ruedee Night Market is the modern traveller's food bazaar. Shops with bright colours and funky designs align themselves in this market, promising your taste buds a delightful tour around the world. The place has cuisines ranging from national to international. So whether you want Thai pork balls, a greasy burger or a chug of drink, this market has got you covered. The ambience here runs high on style, with cool aesthetics and live music streaming in the air. A few boutique stores are also available to shop at, in case your hands begin to feel itchy. 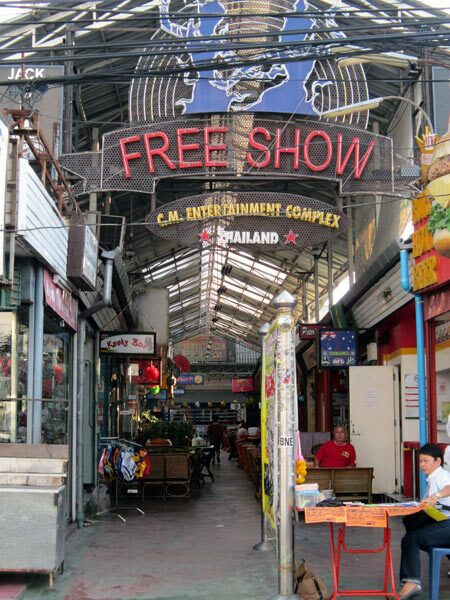 Recommendations: Since the famous Night Bazaar lies in proximity to Ploen Ruedee, both markets can be covered together. An alley lined with around 30 raucous bars and the infamous Muay Thai boxing ring hosting kickboxing bouts, the CM Entertainment Complex is one of those places you can enjoy with your buddies in Thailand. The narrow arcaded lanes have identical beer bars, frequented by loud and rowdy crowds. There may be a fee applicable on weekends, though one can negotiate for a discount. The noteworthy thing about the complex is the free boxing and wrestling nights, with passionate and cheering audience. The cheap menus, loud music and dazzling lights are what make the complex the epicenter of nightlife in Chiang Mai. The beer bars offer live sports screening, dartboards and pools. The pricing is pretty uniform throughout the complex. You must remain cautious as the place may have some safety issues, but don't let that stop you from having fun. Recommendations: It is advisable to go in a large group of friends for safety purposes. Not suitable for families. The Ladyboy Cabaret Show is one of the most dazzling sights you will ever witness in your lifetime. Ladyboys dress up in extravagant outfits to put up a stellar performance of dance and song that has the audience swaying with them. They also enjoy interacting with the audience, which makes the merrymaking even more infectious. Its prime location in the Night Bazaar makes it easy to catch after a night of shopping. Recommendations: Tickets are priced at THB 290 (one drink and snack included), and it is advisable to pre-book them. Chiang Mai's prime water source, the Ping River, is the epicentre of activity in the city. Whether it is daily commutation, cruises, or adventure activities like rafting, kayaking and boating, the Ping River has got it all. Various companies, most notably the Mae Ping River Cruise, offer tickets and tours that give an opportunity to introduce yourself to the Thai way of life. During the day, visitors prefer a laid-back boat ride that explores local lifestyles on the riverbank, while at nighttime, cruise liners are full of couples looking to spend quality time with each other in a posh dinner cruise. Recommendations: Combine the river activities with hiking, biking and zip lining tours to explore the city wholly. By Air: Chiang Mai International Airport is the main airport in Chiang Mai, operating both domestic and international flights. The airport is located 3 kilometres South West from City center. By Train: Chiang Mai train station is located 3 kms from City center and daily trains operate from Bangkok to Chiang Mai. By Road: Arcade Bus station is where most buses to Chiang Mai arrive. Daily buses operate from Northern bus terminal in Bangkok to Chiang Mai. Nights in Chiang Mai don't ever seem to end. As the sky gets darker, more and more streets light up with the city's nightly culture. So whether you want to party with no holds barred, or enjoy a peaceful stroll along the night markets, Chiang Mai has got it all.